This is the tax-saving season. And for those of you who have decided to invest in ELSS funds, the single most important question right now is “Which is the best ELSS fund to invest in”. Google search is often the go-to place for ELSS investors to get an answer to this question. So at ORO, we decided to do a poll of Google search results to find out which ELSS funds are being recommended right now. And there were some surprising results. For all the collective obsession with picking the best fund, there is so much overlap within the recommendations, that we can actually go down to 2 recommended funds (Make that 4 if you want to be more lenient). There is no secret sauce and everybody in the industry is using very similar criteria to shortlist funds. We think that this has important implications for investors. But all that for later. First the results. 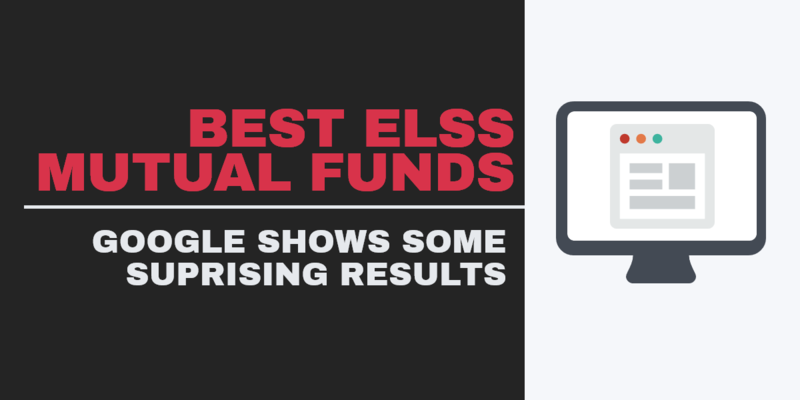 So here is what we did: We searched for 2 popular ELSS related terms on Google “best elss funds 2017” and “best elss mutual funds 2017” and went through all the results that appeared on the Google first page. We did not bother with the search results on the second page since more than 90% of searchers don’t go beyond the first page anyway (Source). We considered both search results and ads. The only results that were ignored were those from mutual funds companies for obvious reasons. There was considerable overlap in the results for the two search terms and in total, we came up with 14 recommendation pages. (You can see the full list at the end of the article). We then gave each page a weight of 1 and its weight was split evenly between all the recommended funds on that page. So since there were 14 results, therefore the total weight was 14. Further, if one page had 5 funds recommendations, then each fund was given a 1/5 weight. This was done because if a source is recommending only one fund, then that shows greater conviction in the recommendation vs. a source which is recommending 10 funds. And at the end of it all, these were the results (*drum rolls*). The two ELSS funds which come right at the top in our analysis are Axis Long Term Equity Fund and DSP Blackrock Tax Saver Fund. And if you were looking to invest in more than two funds, then perhaps you could consider Franklin India Taxshield and Birla Sun Life Tax Relief ’96 as close seconds. Surprising consistency in Results – there is no secret sauce! The most surprising thing about these results is the high degree of overlap between the recommended funds from these different sources. But should we be surprised? 5. Risk and Risk-adjusted returns: Has the fund been able to deliver this outperformance without taking too much risk. Risk-adjusted returns are the ratio of returns to risk and were measured through a number of well-known ratios such as Sharpe, Calmar etc. And that’s it. Yes, each of the sources may have measured these parameters in slightly different ways. For instance, some kept the cut-off age for funds at 5 years and others at 6 but at the end of the day these differences were quite minor and they converged on the same set of funds. Did you know “best mutual fund to invest in” is the most searched term related to mutual funds in India? But the biggest result of this analysis that there is no secret method for coming up with such funds. There are a few common sense criteria and almost everybody in the industry knows them and uses them. And further all these criteria are numbers-based and rely on past performance, so anybody can calculate them and come up with this list! If there is no special mystery in coming up with a list of good ELSS funds to invest in – you can run your own set of numbers on a spreadsheet or simply google recommendations like this – then the best thing for investors to just invest in these funds with the lowest possible costs. After all once you have a shortlist of good funds, lower costs directly translate into higher returns. And the lowest cost method of investing in mutual funds is through direct plans. The table below shows how much you could save in each of these funds by just opting for a direct plan instead of regular plans. So ELSS investors, the investment implication is clear for you – pick a fund you like from this list and go direct! Disclaimer: If you are tired of reading till this point, you can totally skip this section. At ORO we do not believe that selecting the best mutual fund is the most important role of an advisor. Yet many investors are often led to believe by their advisors that this is the most important thing in investing. Hence this is all they should expect of their advisor and if the advisor has recommended them good funds, then he/she deserves to be paid commissions year after year after year. What this analysis does is bust this myth around mutual fund selection. There is nothing special in coming up with a list of good mutual funds to invest in. It can be done on the basis of a set of purely quantitative (i.e. jargon for numbers-based) criteria. Some people claim that they look at qualitative (i.e. jargon for ‘I know more about the mutual fund industry than you’) criteria but we hardly find evidence of that making a difference. And you know what? When something is so numbers-based, it is better done by a computer. And the good thing about technology is that if something can be automated, then it can be made available cheaply for everybody without compromising on quality. That is why we at ORO provide our top mutual fund recommendations for free. And you should also stop paying your hard-earned money to an advisor whose only value-add to you is selecting mutual funds.